AgeCare Columbia is conveniently located close to amenities and to downtown Lethbridge, and our certified Recreation Therapist is skilled at developing great activities and events to attend. AgeCare Columbia is a retirement living setting where residents become friends…the very definition of community. I am very happy living here, should have moved sooner. AgeCare Columbia is designed with seven warmly decorated leisure areas surrounding two elegant atriums. Both atriums feature fireplaces, which adds to our warm and friendly community. This feature is especially welcome during evening meals when residents experience a restful and pleasing ambience. AgeCare Columbia’s unique design lends itself to an intimate and welcoming retirement lifestyle, with small groups of suites facing 14 distinct leisure areas that lead to a wide-open atrium. Each neighbourhood within AgeCare Columbia is equipped to provide the level of service that aligns with the needs of our residents. 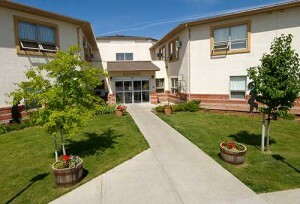 The Chinook neighbourhood contains 62 Retirement Living suites and is designed to support active, independent seniors. The Westwind neighbourhood is comprised of 50 designated Supportive Living Level 3 (SL3) suites and is designed to provide residents with an added level of support. At AgeCare Columbia we believe in offering you as many retirement living options as possible for worry-free living in a friendly, caring, safe and secure environment. The unique design of the community lends itself to an intimate and welcoming retirement lifestyle.